Last week, Paradox released two big expansions, both for games that I love, but I ended up playing neither. 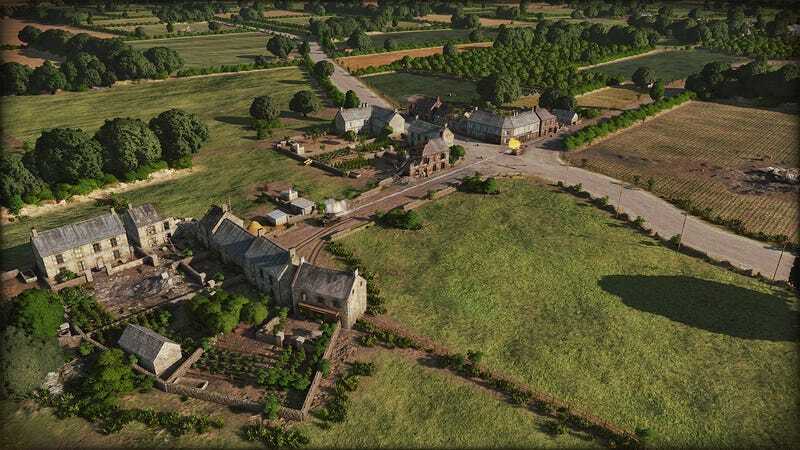 Instead, I was messing around with a third title of theirs that was released a bit more quietly: a beta for Steel Division: Normandy 44, an upcoming real-time strategy game. Developed by Eugen, the guys behind RUSE and Wargame, it builds on the foundations of both those titles, in that it’s a big-map, real-time strategy game that wants to test your tactics more than your resource-gathering. Which, as we’ve covered, is something I like a lot. There’s not much of the game available at the moment; just two singleplayer skirmish maps and some multiplayer. The final game is promising hundreds of units across way more maps, along with a full singleplayer campaign. What’s there, though, is cool. The game’s built around the idea of army-building before you even start a match, rather than gathering points or resources while already in one. So from a long list of available units across all major classes—infantry, armour, air, support, etc—you get a certain amount of points and construct a force according to how you want to play. Better units cost more, of course, but there’s more than just an economical balancing act to play. The game also works on a staggered schedule of A, B & C class units, with only A-class (usually the weakest ones) available to players for the first few minutes of a game, then B, then C.
So you aren’t just timing the cost of your units, but the timing of their arrival as well. It’s all well and good loading your army with big, strong Panther tanks, for example, but if you can’t bring them onto the battlefield until you’re ten minutes into a losing battle, then you might have been better off opting for a few Panzer IVs instead. Steel Division is also a game about scale. Here’s a strategic view of a small map, showing the location of each unit along with the avenues through which your reinforcements will arrive (they have to manually travel to the battlefield instead of just magically appearing, so you need to secure your supply lines). Which you’ll be doing a lot, because while it looks and sounds like a fast-paced RTS, it’s actually quite plodding and involved, to the point where you can pull up each unit’s line of sight to better help plan defensive assignments and where to place guns. Like I said, there’s not much to it at time of posting, but I’m liking what’s there so far. I dig how your entire army can be customised, because it feels like your army, in the way that a Pokemon or Magic deck might. And I like the way your units need to plod their way onto the battlefield instead of just magically appearing outside a tent, because it makes their deployment more involved than simply clicking madly where you need reinforcements. I’ve also got some concerns, though. I’m not the biggest fan of the way unit deployments are staggered. I can see why this is a thing in this game; it’s a novel way of approaching RTS unit rushes, and gives Steel Division an almost board game flavour. But it also gives the game a weird flow, almost like the quarters/halves of a sports game, as players rush then pause while teams await the arrival of better units. Again, I understand the idea—controlling this many units over this much ground is weirdly exhausting, so breaks can be welcome—but the actual implementation feels a bit restrictive. Steel Division also feels like it’s missing a few basic commands. While the idea of its reinforcements and deployments is a good one, it works best at the start of the game when things are nice and calm. Ten minutes later, when you’re in the thick of it, there can simply be too much going on to be able to keep on top of everything happening with the troops you already have on the field, let alone the ones lumbering into position behind the lines. A more streamlined approach to deploying and unloading your troops off the truck might have calmed my nerves during some of my bigger, more hectic fights (and given more importance to holding certain parts of the map). That said, some of those problems are only present in smaller matches; in larger, 3v3 or 4v4 games, your focus on the map becomes so narrowed that it becomes easier to manage your forces (these games can be more fun anyway, as the gaps between armies allow for much more enjoyable flanking/defence strategies than those with less players). Steel Division will be out at the end of May on PC.